It's a fun class and a great work out with all participants supporting one another's efforts. We begin each class with a slow meditative warm-up and progress into zill (finger cymbal) practice. Zills are gradually incorporated into dance movements as the session proceeds. Fundamental posture, poise and line are taught with all the basic dance steps. You'll learn shimmies, spins, Arabic and Egyptian basic steps and variations. You will swirl with veils and conclude the session with a complete choreographed routine. Special dance events are announced and we often gain creative insights from viewing dance videos during classes. 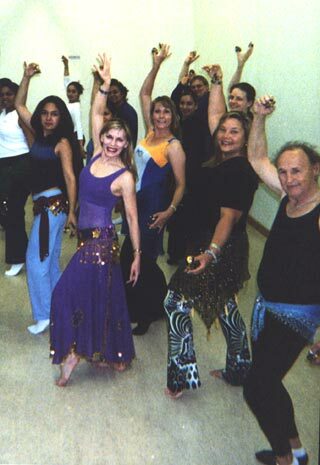 If you've taken Beginning Belly Dance before you'll still find lots to learn. With 12 hours of class per session we have time to progress to intermediate combinations. I develop new choreography for every session. I'm very conscientious about analyzing each step and verbalizing in detail body line, isolation, weight changes and layering of movement. Every student is given individual attention and suggestions for improvement and most importantly praise and encouragement. I've been teaching for many years and never tire of the thrill I feel as I see students blossom into lovely dancers. Join us for a great time while you dance your body into shape!